Here’s a lovely spicy chicken curry recipe that’s easy to prepare. An easy chicken curry cooked in a single pot with no marinating for hours. Using a good-quality curry powder or paste takes all the work out of making this fabulous dish. For the best flavour, make it a day ahead and reheat. 1. Remove the skin from the chicken joints, if preferred, and season them with salt and pepper. 2. Heat the oil in a deep frying pan or flameproof casserole. Add the chicken and brown it on all sides for 6–8 minutes over a medium heat. Remove and set aside on a plate. 3. Cook the onions in the pan for 5 minutes until golden brown, stirring regularly. Add the garlic and curry powder or paste and cook, stirring, for 1 minute. 4. Add the stock, tomato purée, sugar and seasoning. Mix well and add the chicken. Bring to the boil, then reduce the heat, cover and simmer for 45 minutes or until tender, turning the chicken pieces halfway through cooking. 5. Remove the chicken to a serving dish using a draining spoon. Heat the sauce over a high heat for 2–3 minutes until reduced and thickened. Take the pan off the heat and stir in the yoghurt. Check seasoning, then pour the sauce over the chicken. Scatter over the chopped coriander. *Add a finely diced eating apple and a handful of raisins to the curry 15 minutes before the end of cooking. You can substitute cream for the yoghurt. 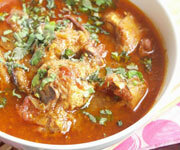 *Serve with boiled rice or warm naan bread. Make a banana raita accompaniment, with sliced bananas tossed in Greek-style yoghurt.